I don’t necessarily believe in trends, make up trends in particular. 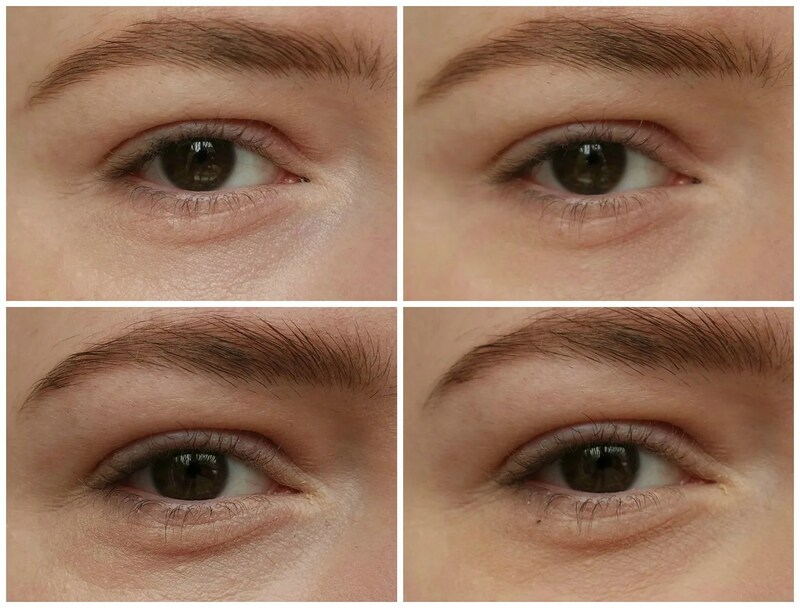 From strong contours to perfect brows: when I do my make up I like to keep things fairly simple and basic. But that doesn’t mean that I don’t want to try some products that are center to the hype. One such hyped product? 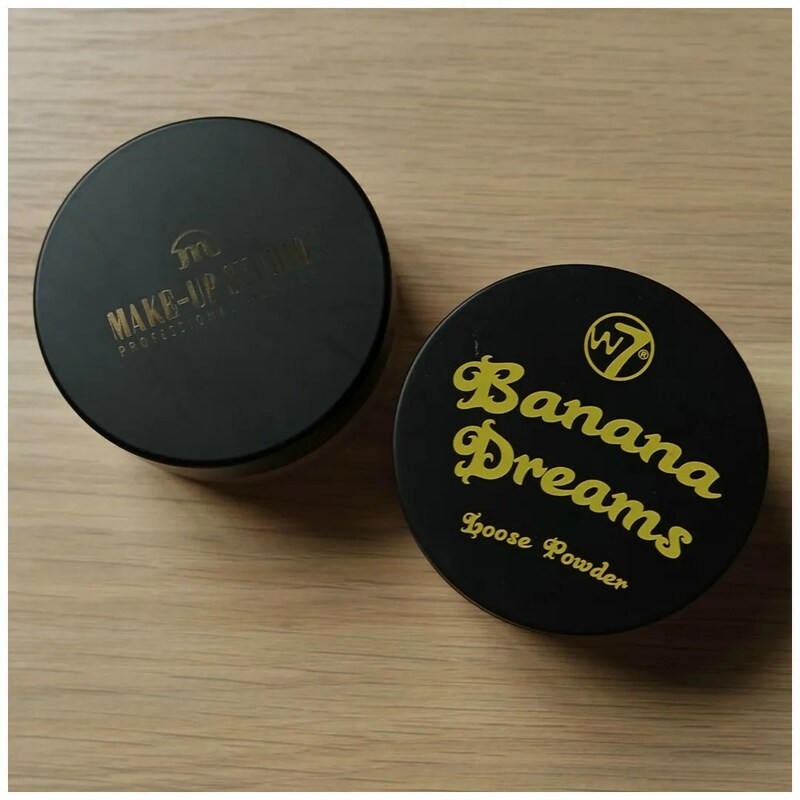 Banana powder: a (often loose) yellow powder that should set your under eye make up and brighten and highlight the triangle under your eye. I tried out a budget and more high end version. Which banana powder would be better? And how would it work on my skin? This entire review began when I received the Make Up Studio Banana powder in the Misslipgloss goodie bag I received last summer. I tried the powder for a while, but wasn’t convinced it would make a good review just yet. Then I came across the W7 version: super budget proof and it should do the same thing. 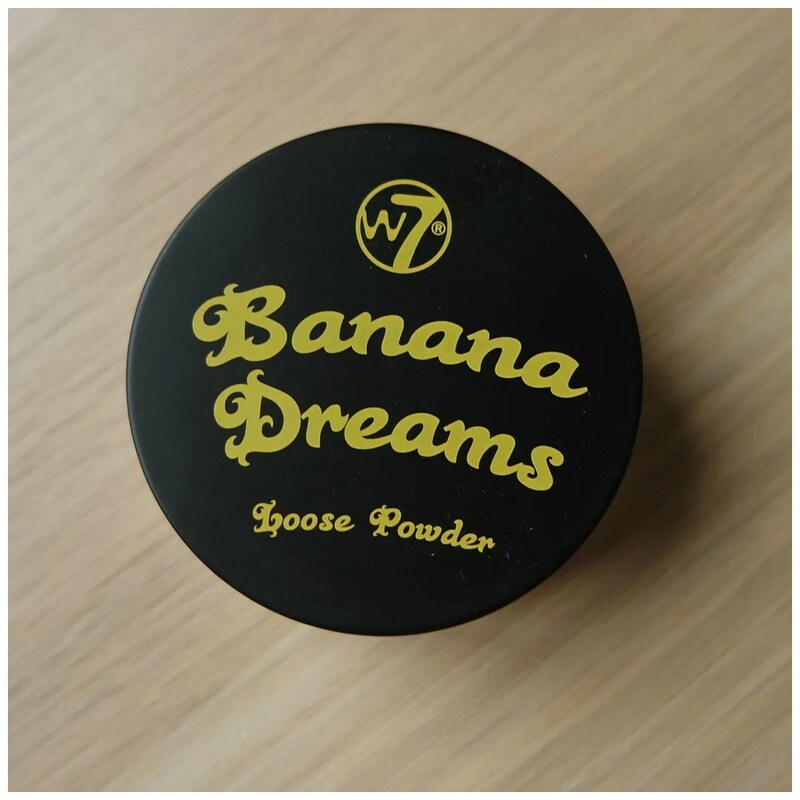 I decided to compare the Make-Up Studio Translucent Powder Extra Fine in Banana with the W7 Banana Dreams Loose Face Powder. Let’s start with the high end product: the one I received first. This jar contains 10 grams of product and retails for €18.90. The packaging is similar to that of a loose powder. 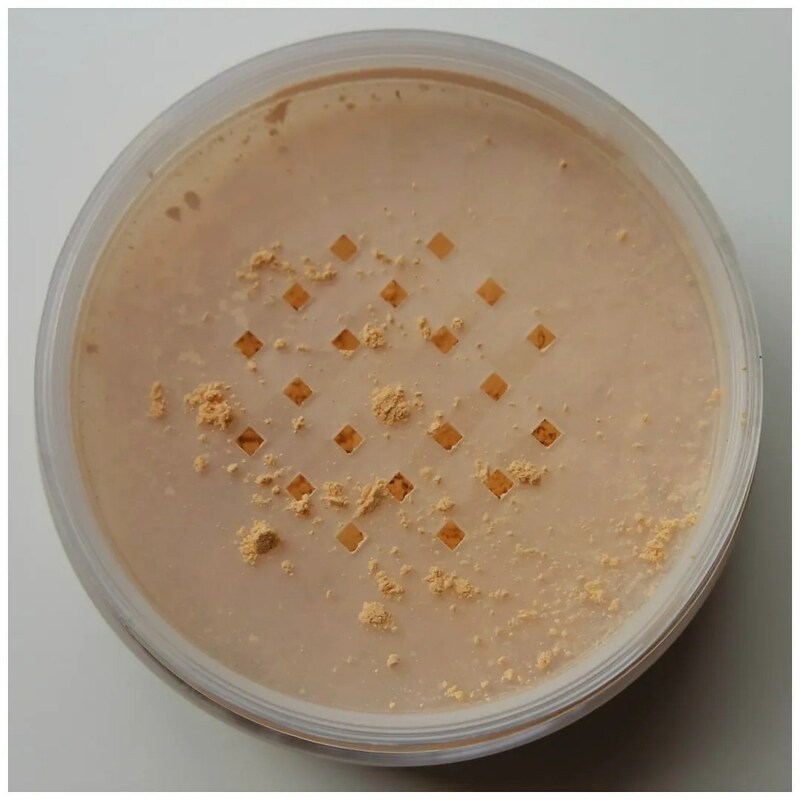 The product comes in a plastic jar with a sifter. The packaging doesn’t feel very luxurious and quite cheap. The product is listed on the website (which is only available in Dutch I’m afraid) as suitable for all skin tones to set and highlight make up. They do indicate this powder works best on medium to dark skin tones. When I took off the seal, the product didn’t kick up too much powder: a plus. 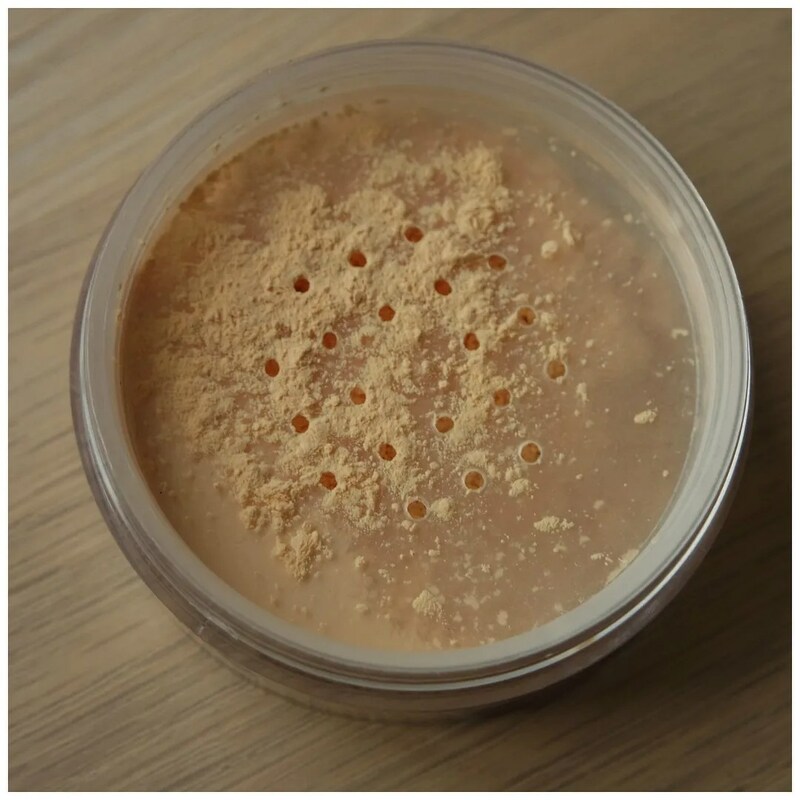 The texture of this powder is lightweight and finely milled, but it doesn’t fly everywhere. Staying power is nice: my under eye concealer hardly creases when I use this, especially if I let a thin layer of powder ‘cook’ my concealer first and then wipe it away. Looking at the color in the jar though, it does look a little bit dark for me, but I am all for giving this a go. At a price point of only €6.95, the W7 version of this product costs about a third of the one I showed you above. I even bought this on sale in a 2 for 10 deal, so in the end I only paid €5 for this. You do get even cheaper packaging for this: no sticker to hold down any product during initial transportation and thinner plastic. I find the lid closes not so tightly on this as well, so be careful if you take this traveling anywhere! 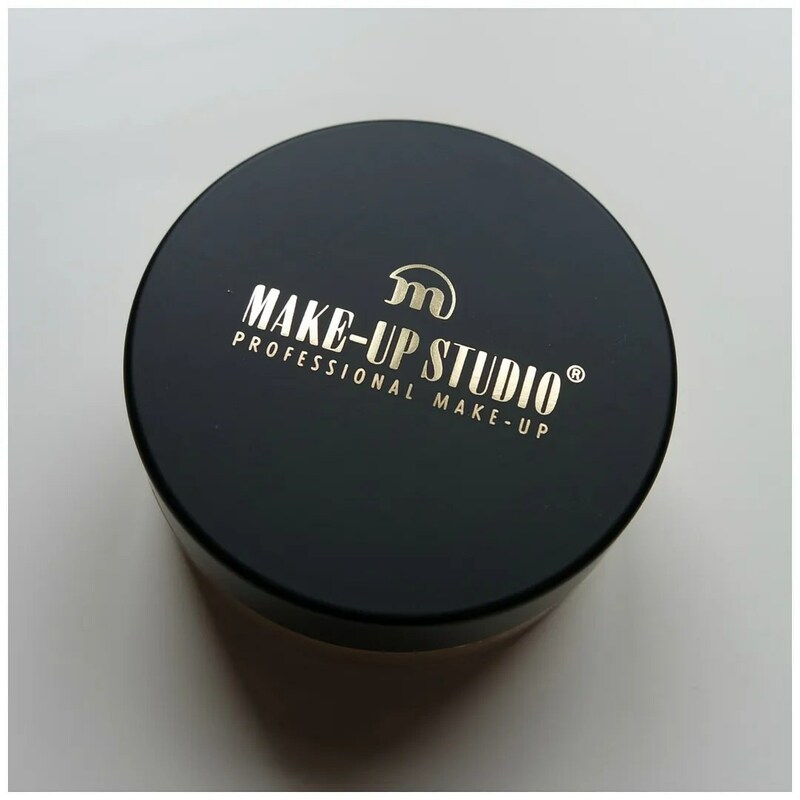 The claims for this powder are exactly the same (as in the text on the Make-Up Studio website and the website where I found the W7 information is exactly the same). 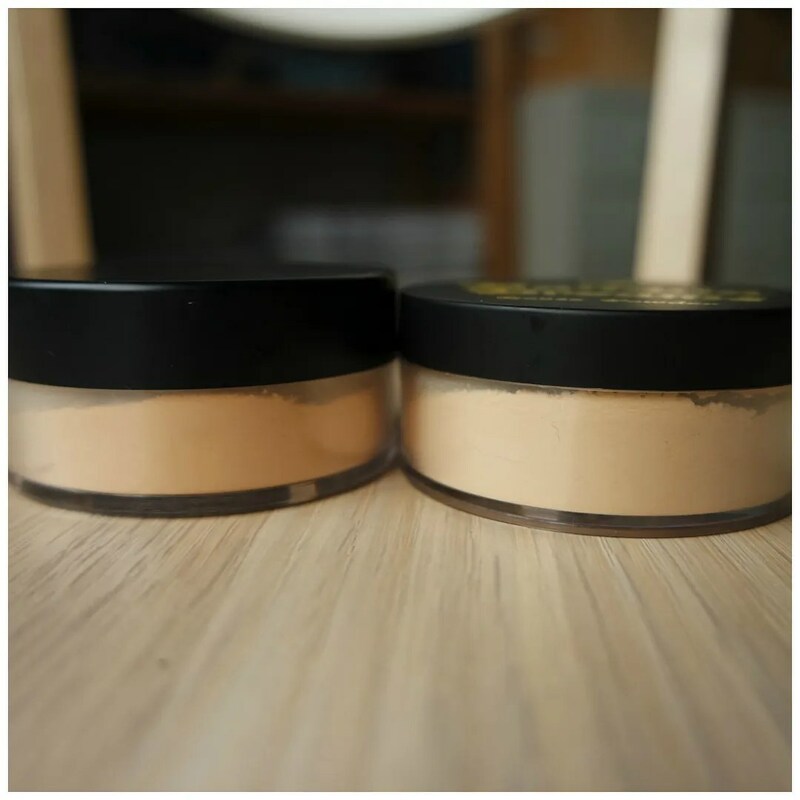 This powder should set your make up while highlighting your complexion. It should not leave a white cast and just like the Make-Up Studio product this should be a translucent powder. As you can see this product packs together a bit more. It is still finely milled, but where the other one hardly kicks up any dust, this just flies all over the place if you’re not careful. I found this worked equally as well as the Make-Up Studio variety: it locks my make up in place which is ultimately what I want it to do the most. The color of this does look a little lighter looking at it at first glace as well. Time for the comparison! First up: color. As you can see in this picture, the Make-Up Studio is at least a few shades darker than the W7 version. On the skin this was definitely noticeable. 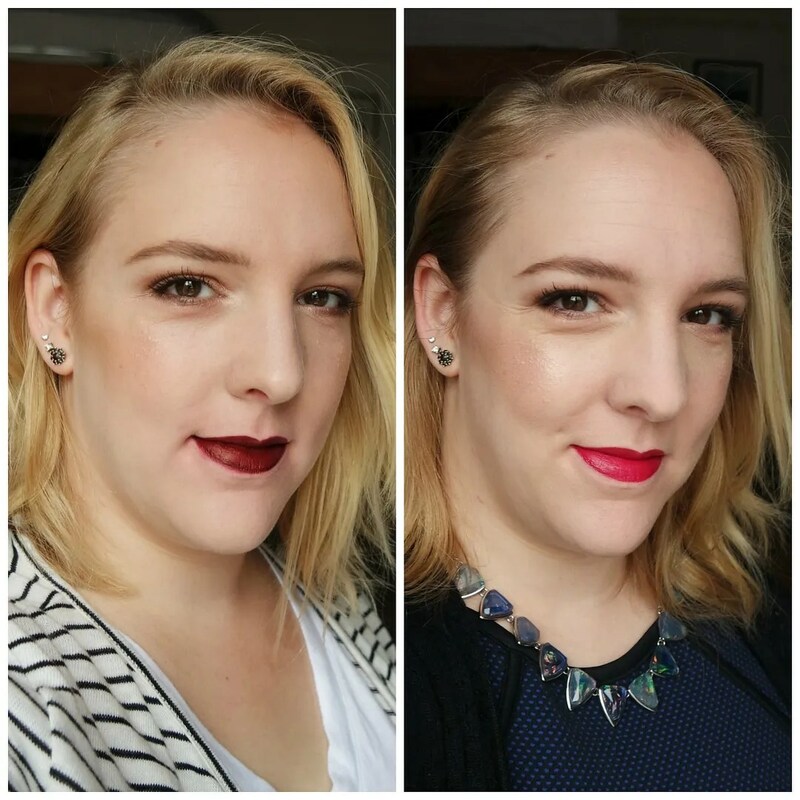 I got the Make-Up Studio Banana Powder at the end of summer and I had to stop using it around October as it became too dark. Now that it’s winter and I am a fair bit paler than I usually am, the W7 one is a better match for me. Consistency wise I would go for Make-Up Studio though. The powder is finely milled, but doesn’t fly everywhere when you stick your brush in. It also comes off as more translucent than W7 Banana Dreams. 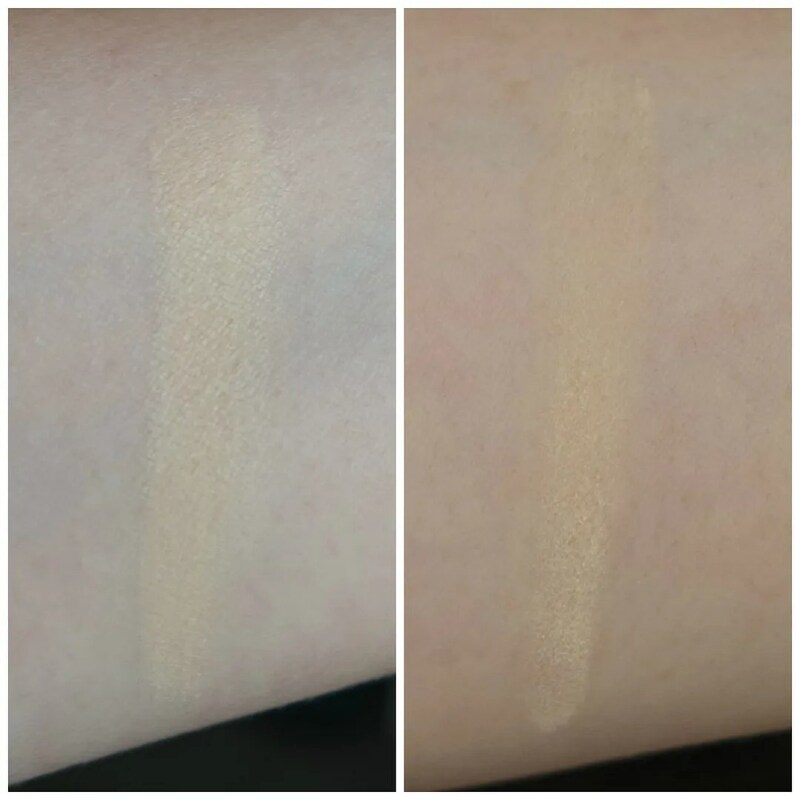 The swatch pictures were taken on different days with different lighting which is why they aren’t fully comparable, but you can see the finish each powder gives. W7 is clearly more opaque and does not fall in the category ‘translucent’ in my book, even though it is one of the claims on the product. On the left you can see my under eye area with just a touch of concealer. On the right you can see the effect both banana powders give. 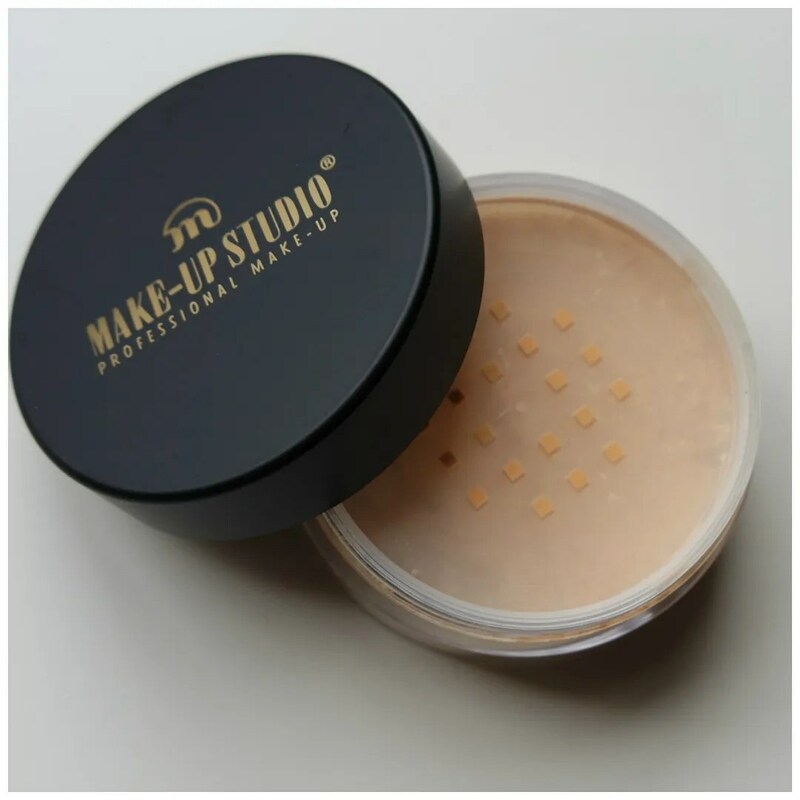 Here you can clearly see that the Make-Up Studio powder is much more translucent and gives off a much more natural finish than the W7 powder. W7 gives more coverage, but both powders change the color of my concealer from brightening and slightly highlighting to a much more deeper tone. Since I am so fair skinned, not just one but both shades are a touch too dark for me. 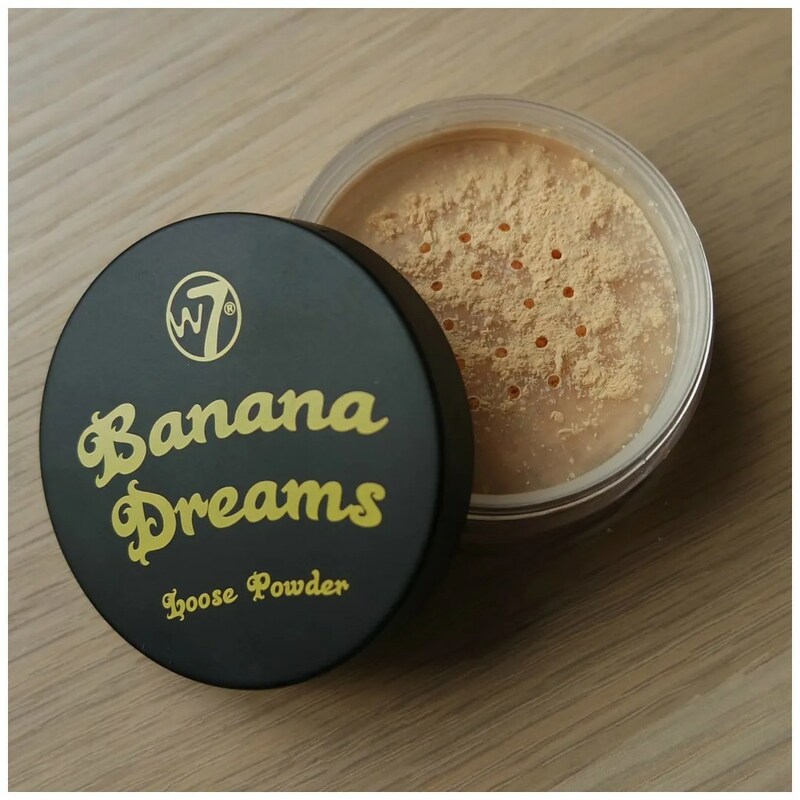 Even the W7 powder which is much lighter than the Make-Up Studio powder. Bear in mind that I took the Make-Up Studio pictures just after summer and I was a bit darker than I was when I took the W7 pictures. If I were to wear the Make-Up Studio powder now, it would look even more obviously yellow and dark than the W7 does at this moment. Full face the powders aren’t as noticeable, but especially the W7 version leaves a yellowish cast on my skin. Make-Up Studio doesn’t as it has a more translucent finish but I have noticed now that it is much too dark, that yellow cast is as much present when I wear that one. Instead of a brightening, highlighting effect I think both powders make me look as if I have come down with some sort of liver condition, which isn’t exactly a flattering look to be honest. I would definitely not recommend using this all over if your skin is like mine and resembles Snow White. No, banana powders, simply aren’t for me. If you have an olive or dark skin tone I am sure this could work for you, but for the pale ladies in the world this is one trend I recommend you skip. Do you wear banana powder? How do you make it work for you? Thank you! Yes, if you’re as fair as I am (i.e. NW 15 in MAC or lighter) then I would suggest banana powders are too dark for you. haha lever conditie XD liever niet, jammer dat ze je niet bevallen. Tja, niet alle make up trends passen bij elke persoon. Dit is er eentje die niet voor mij is weggelegd kennelijk.